My Hugo Ballot Is In! Today is the last day of voting for the Hugo Awards and I wanted to share a few things about my experience as a first-time voter. #1 – The Hugo packet was really helpful. I was able to use that to get more familiar with certain categories, works, and individuals and vote for more things than I had expected when initially reviewing the ballot. The packet included some whole works (all of the novellas were included in full), some samples, example works from artists, and even bios for certain individuals. I ended up reading three of the included novellas, one novel, and reviewed what I had time for, which, admittedly, was not everything. Still, it was very helpful and certainly made me feel a bit better about my vote (and about the cost of participation). #2 – I still left more than half of the ballot blank. I simply did not have enough familiarity with certain topics, let alone the nominated works or individuals within the topic, to make an informed vote. This was particularly true in most of the short fiction categories, as that is an area of reading that I don’t delve into with any regularity. #3 – I generally avoided No Award. There were one or two times that I used it strategically to help keep certain entries (which I felt were particularly undeserving) from winning, but, for the most part, I didn’t feel good about using that option or really feel like I knew the works well enough to determine whether they were “good enough” for a Hugo. #4 – I could do with less drama. I get why the slates have emerged and also why so many people are upset about it, but it really does make the whole experience a bit less fun than I had expected. Yes, I certainly did take enjoyment in certain aspects of the process, but I also felt compelled to make myself aware of which works were part of slates and I’m sure that impacted my vote to some degree. However, I generally just tried to vote for what I liked best. I know that I voted for works or individuals that were on slates and I don’t really care. If they win, hopefully, it’s because the most people voted for them and they deserve it. #5 – I don’t know if I’ll vote next year. Keeping up with all of the works that come out in a year and then selectively reading those works just so you have enough information to nominate is tough. I ended up keeping a list of novels published in 2015 that caught my attention and then I would try to grab titles from that list whenever I could. I also kept a document to keep track of good television episodes, movies, artists, and so forth so I would have a pool of options to nominate from. Probably the biggest issue for me though was simply making the conscious effort to read new books, and then attempting to choose those that you think will be “award worthy.” I don’t read that many books each year so that means that some older novels that I really wanted to read have to get pushed back or, who knows, I might not end up reading them at all. It makes choosing your next read a bit more complicated and I’m not sure how much I really enjoyed that end of it. It was also pretty disheartening going through all of the efforts to nominate and then see mostly slate nominations make it to the final ballot. I know that new rules will be in place for next year, but it’s still not clear how effective they will be. #6 – I’m happy I voted. Even with all of the caveats, I’m still glad that I participated. 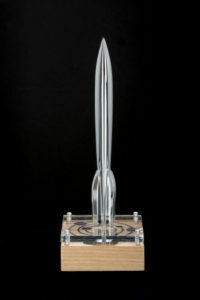 I felt more connected to the SFF community and I got to learn more about one of the most prominent SFF awards. It was an interesting experience and, although I may or may not vote again next, I suspect that I will vote again. Best of luck to all of the nominated works and individuals! There are several novels that I really wanted to read (particularly V.E. Schwab’s A Darker Shade of Magic and Fran Wilde’s Updraft) that I didn’t get to and I have to wonder if any of them would have made my nomination ballot. I actually think it’s a distinct possibility since I rated only two novels at five stars from this list: Golden Son by Pierce Brown and The Fifth Season by N.K. Jemison. …I’m ruling out The House of Shattered Wings because I didn’t like it well enough to finish. …I think I will eliminate both of the Sanderson novels, even though he is most certainly one of my favorite authors. I just didn’t think Firefight or Shadows of Self were among Sanderson’s finest works, or even as good as the first in each of their respective series for that matter. …I think I’m going to rule out Providence of Fire, because, despite what I’m seeing from a lot of other folks, I don’t think this series is really doing anything new and, in fact, I find to be completely laden with RPG-inspired tropes. It was still a decent read, but I don’t think I liked it well enough to put it on my ballot. … I think I’m also going to knock out The Fold, which I thought was amazingly fun through about the first two thirds and then it turned a weird direction and it kind of lost me. Again, I still liked the novel, but I think I’m going to leave it off. And I think I’m pretty happy with that. There are A LOT of categories that I have not touched and that’s largely because I don’t really read short stories. I will definitely nominate five novels before the end of the month, but I want to N.K. Jemison’s The Fifth Season before I do so. I may ultimately try to sneak in one more novel, but we’ll see. This has been a pretty fun process, but it kind of takes a lot of planning and research. I ended up creating a document to track the various categories. Basically, any time I came across a really cool book cover or watch an especially good episode of television, I noted it in the document. But even then, I found that I had to look up a lot of information in order to fill out the ballot. I’m kind of surprised just how laborious the entire process is, but perhaps that simply reflects the passion of the community. Anyways, I’m looking forward to submitting my nominations and seeing the shortlists (which I think come out around Easter). It will be interesting to see if other voters liked any of the same works that I did. And then I’ll have to read some of the other nominated works so I can make an informed vote, which doesn’t sound bad at all. I finished Brandon Sanderson’s Shadows of Self a few days ago. It’s the seventh novel published in 2015 that I’ve read and actually the second by Brandon Sanderson. 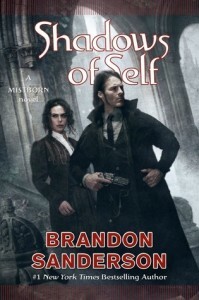 Shadows of Self is a Mistborn novel set in the “Wax and Wayne” time period, which has very “turn of the century” flare to it. I really liked The Alloy of Law, the first novel in this time period, so I was pretty excited about Shadows of Self and, while I thought it was pretty good (4 out of 5 stars), it didn’t quite live up to my expectations. 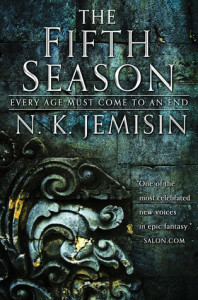 In this novel, Sanderson pulled in the mythology from the first trilogy and worked it into the very fibers of the plot. In some ways, I liked that, but, in other ways, I didn’t. Alloy of Law was so unique and unexpected. You could pick up little hints from the original series and get a vague idea of how and why the world progressed as it did, but it was fresh and new and had a life of its own. But then in Shadows of Self, Sanderson basically just went and explained all of the mysteries and connected everything very firmly to the characters and events from the original series, which made it feel much more like an extension of the original series than its own unique world. Despite that, the plot was excellent. It was fast paced and exciting with plenty of suspense and mystery to keep you interested. And the ending was so good. So good. I was also very glad to be reunited with Wax, Wayne, and Marasi. I really like all of the characters from this series. They are each very different, but work very well together. I think there’s a pretty decent chance that this will make my Hugo nomination list. If I had to make it right now, I think it would, but it’s already kind of a tough call. Out of the seven novels that I’ve read so far that were published this year, none of them really stand out as being way better than the rest so it’s pretty hard for me to figure out which two I would cut, but it may get easier as I read more. Right now, I’m listening to Red Rising by Pierce Brown, which is really good so far. I’ll almost definitely listen to Golden Sun after that, which will give me another 2015 novel. And then I think I might dig into John Scalzi’s Old Man’s war universe, because I read the first one a long time ago and really liked it, bought the second a year and haven’t listened to it yet, and I’m hearing good things about the latest installment, The End of All Things. As for actual reading, I’ll be traveling soon so I’m going to stick with what’s on my Kindle. I have at least a half dozen novels lined up on there, but none of them are from 2015 so I guess I’ll have to take another hiatus for a bit. As perhaps you can tell, I’m in the midst of a little Hugo holiday. I just got done reading The Master and Magarita by Mikhail Bulgakov after receiving it as an anniversary gift from my wife and now I’m reading The Bane of the Black Sword, the fifth Elric novel, by Michael Moorcock. I’m also listening to Helene Wecker’s The Golem and The Jinni, which is simply lovely so far. Speculate! recently produced a couple of episodes about the novel and I’m looking forward to listening to them when I finish. At this point, I’m not sure what I’m going to read next. There’s a pretty good chance that I’ll read another Elric novel since my craving for “hack and slash” sword and sorcery may extend beyond my current read, or I may pick up Aliette de Bodard’s The House of Shattered Wings and resume my Hugo journey. For audio, the choice is easy: I will definitely be listening to Brandon Sanderson’s most recent Mistborn novel, Shadows of Self. Not only do I love Sanderson’s works, but I also love Michael Kramer’s narration of his work. It’s been nice to read a couple books from my bookshelves, but I hope to get back to some new releases very soon. P.S. GRRM has posted some thoughts about the Long Form Dramatic Presentation category that are worth checking out. I currently listen to eight SFF podcasts and I think they would all be considered “non-professional” although I’m not entirely sure what that means. I think all eight of them have Patreon pages now and essentially take donations from their fans. Some of them also have sponsorships of some kind. Does making a profit mean they are “professional” or do the hosts have to be authors, illustrators, etc. to earn that distinction? I have no idea, but does it really matter? Podcasting is something that anyone can do. You don’t need expensive equipment or expert technical knowledge. I did a podcast for five years and we were able to make it sound pretty good using a $20 microphone and free audio software. And why are we excluding “professional” podcasts from awards anyway? There is no “professional” equivalent given out so why are we distinguishing in the first place? That seems like we’re cutting out a segment of podcasts for no good reason. But it’s also worth noting that some podcasts might actually be better suited for some of the other award categories. For example, there are some podcasts that could probably fall into the category of “Best Dramatic Presentation,” like Welcome to Night Vale, which is essentially a serialized story in the tradition of the old radio dramas. Perhaps others could fall under “Best Fanzine” or “Best Semiprozine” (best what? ), like Escape Pod or Podcastle, which provide audio narrations of short fiction stories. Overall, I like that there’s a “Best Fancast” category, but I wish the category was a little more clearly defined (or that I understood it better). I’ll definitely be nominating several of my favorites, including Tea & Jeopardy, Geeks Guide to the Galaxy, and Sword & Laser. I would probably use my other two nominations for The Coode Street Podcast and Rocket Talk, but I also enjoy The SF Signal Podcast, The Once and Future Podcast, and Speculate! If you like author interviews and conversations about all things genre, you can’t go wrong with any of them. 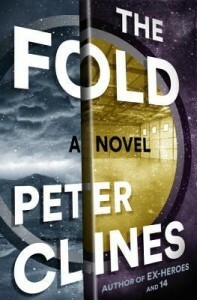 I picked up The Fold by Peter Clines at the library on something of a whim. I was scanning through the new books section, because I wanted to read something published in 2015 as part of my ongoing Hugo Awards quest. Several novels caught my interest, but, for some reason, I gravitated to The Fold even though I knew very little about it. Having finished reading the novel, I have to say that I made a good choice. The Fold was definitely an entertaining read and I enjoyed it thoroughly. The novel follows Mike, a genius who just wants to normal, who’s recruited by a friend to investigate a top secret DARPA project that has everyone on edge. The novel does a great job building suspense and mystery, making more than a few allusions to Sherlock Holmes. Likewise, the novel was very well paced and I found it hard to put down. Another pleasant surprise were the numerous geeky references, which helped add levity at key moments. Overall, the novel was well written and simply fun. It even has a nice twist that takes the novel into unexpected territory. I would certainly recommend it any readers who enjoy near-future science fiction. Is The Fold likely to make the Hugo shortlist? Unfortunately, I don’t think so. It was certainly entertaining and it may end up on my ballot, but I haven’t seen much buzz about it online. Do I think it’s good enough to be considered? Maybe. It certainly wouldn’t be the strongest contender, but it was definitely fun and imaginative and I think that counts for something. Right now, I’m partway through Brian Staveley’s Providence of Fire on audiobook, which is pretty good so far. I also just started The Master and Margarita by Mikhail Bulgakov. It’s a classic Russian science fiction novel and one of my wife’s favorites, so when she gave it to me on our recent anniversary, I decided I should take a break from my Hugo quest and read it. Just a quick note today. Last night, I went to see The Martian. It was very entertaining and I would recommend it to anyone. You certainly wouldn’t have to be a science fiction fan to like the movie. However, if you are a science fiction fan, I think the movie will be that much more enjoyable. 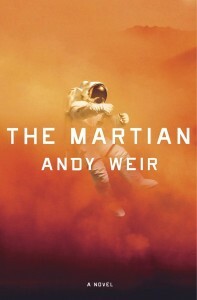 As you probably already know, The Martian is an adaptation of Andy Weir’s novel of the same title. I listened to the audiobook in April of last year and I loved it. I even remember thinking that it would make a great movie. I mean, the image of Mark Watney driving a Mars rover while listening to disco–that’s just pure gold right there. So yeah, this one’s almost certainly going on my Hugo nomination ballot for “Best Presentation (Long Form).” Voters can “nominate up to five entries in each category” and I fully expect that when the year is out, I’ll still consider The Martian to be one of the five best SFF films of the year. What else will I nominate in that category? Well, at this point, I would only put money on Ex Machina, but I still haven’t seen Mad Max: Fury Road and I’ve heard so many goods things. I finished reading The Grace of Kings by Ken Liu recently and I’ve found myself thinking about it on and off ever since. I’ve been trying to figure out how I felt about it and, ultimately, I think I can say that it wasn’t my favorite novel, but I will certainly acknowledge that it’s different from any other epic fantasy novel that I’ve read. The story was uniquely told, in a way that reminded me very much of oral traditions. I could very easily imagine the story being told around the campfire by an elder to children. The story was truly epic, spanning several years and the entirety of the world. The novel was based on Chinese history and mythology, which we don’t see very often in fantasy novels. It was definitely nice to read something a little different. The “oral” style of the narrative was certainly unique, but I felt it oversimplified things a bit at times, especially the emotions and motivations of characters. As a result, many of the characters felt unrealistic. It also resulted in very simple language. That’s not necessarily a bad thing because it allows for many levels of reader to comprehend the story, but it just felt a little too ordinary to me. The story was also told from a very distant perspective, basically the gods’ view. Although that was interesting in some ways, it meant that the novel didn’t really go into the head’s of the characters very often and that made it difficult to connect with them. I will admit that I connected with Kuni to some degree and he was probably my favorite character. Why is this going to be a series? I thought the ending would have been perfect for a standalone novel. I think 2015 is going to be a really great year for speculative fiction, especially novels that break the mold and try to take genre fiction in new directions or tell stories from new perspectives. This is a great think in my mind, but it’s going to be really challenging to give out awards. 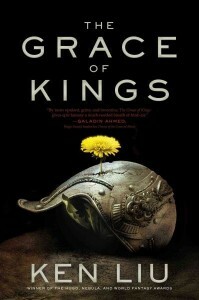 I think The Grace of Kings will certainly be in the discussion for a Hugo Award and I wouldn’t be surprised at all if it makes the final ballot, but I really have no idea today if it is really a contender to win. I’ve nearly finished Ken Liu’s The Grace of Kings and I’m already trying to decide what I’ll read next. I would like it to be a novel published in 2015 so I can continue to work towards my goal of reading Hugo-eligible works for the rest of the year. Already, I don’t expect to fully honor this goal, because there are a lot of other books that I’m dying to read and some of them may prove to hard to resist, especially works that have upcoming adaptations like The Man in the High Castle and Childhood’s End. 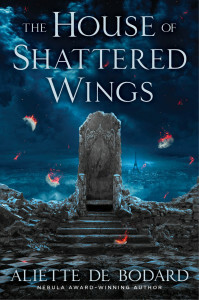 Most likely, I’ll read Aliette de Bodard’s The House of Shattered Wings next, because I was lucky enough to win a copy in a Tor.com sweepstakes (Thank you Tor!). Otherwise, I may pick up something from the library.